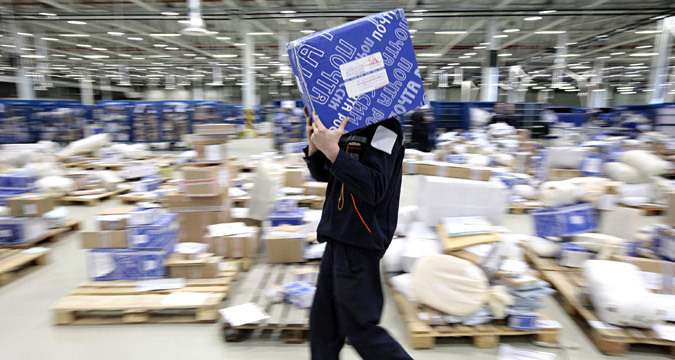 In 2015, a total of 155 million parcels were delivered to Russia from abroad. The move is intended to tackle the problem of counterfeit goods. One in 20 parcels arriving in Russia from abroad could be opened for inspection. The move, proposed by the Association of Internet Retailers, is intended to detect and destroy counterfeit goods. “Consumers should not be punished: they may have had no idea that they were buying counterfeit goods,” Alexei Fedorov, the head of the Association of Internet Retailers, explains. “In cases of trouble, representatives of the manufacturer will be invited to attend the necessary checks and tests and if counterfeit goods are detected, they will be seized and destroyed. After this the consumer will have to take the matter up with the seller." Currently, customs officials check incoming parcels with the use of X-ray machines. If anything suspicious is detected, a parcel is opened up in the presence of witnesses. There are no regulations governing the preventive opening of parcels, the press office of the Federal Customs Service said. Talks to discuss the initiative with the Federal Customs Service may be held as early as this week. However, according to Miroslav Zubachevsky, the executive director of the KupiVIP internet retailer, the problem of counterfeit goods should not be addressed at the point when a consumer receives their parcel but should instead be taken up with suppliers. Internet retailers insist that they are perfectly capable of tackling the problem of counterfeit goods themselves, suggesting that the initiative would only add to the burden on consumers, who will have to foot the bill. In the first nine months of 2015, the Federal Customs Service detected 14.2 million items of counterfeit goods worth 3.5 billion rubles (about $44 million), nearly 50 percent more than in 2013 and 2014. In 2015, a total of 155 million parcels were delivered to Russia from abroad, representing a seven percent increase from 2014. According to the National Association of Long Distance Trade and Data Insight, the internet retail market is estimated at $10.5 billion.